Established in 1980 on Hayling Island, Cottage Cuisine has built a reputation for creative, first class catering. 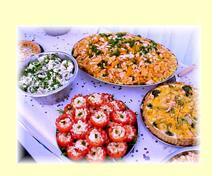 Cottage Cuisine has a wide range of menus available to their customers. The variety includes superb Cocktail Menus to Delicious Hot Buffet Menus. see www.cottagecuisine.co.uk for prices.